Triple antibiotic ointment helps fight infection in minor cuts, scrapes and burns. 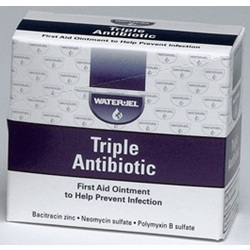 Contains Bacitracin Zinc 400 units, Neomycin Sulfate 5 mg., and Polymyxin B Sulfate 5000 units. These ingredients provide the most effective antibiotic available.